Lately, it's been impossible to change the boys' diapers. They are too busy squirming, flipping over on to their stomachs and wanting to play to even bother to lie down for the two minutes it would take to change them. I started giving them a toy to hold, which would work for a few seconds until they would either drop it, whack themselves in the face with it by accident or worse ... swing it into their soiled diapers. However, If I don't give them something to distract them while being changed, they'll try to escape, cry and make it impossible to put their diapers on securely. So, I did what any modern mom would do. I searched online for a solution. That's when I found the Summer Infant Plush 'n Play Changing Pad with removable Toy Bar for entertaining baby on Babies R Us' website for $39.99, which is around the same price as my previous changing pad that didn't come with a toy bar. Apparently, Summer Infant is the only brand to offer a toy mobile of sorts with their changing pads, but I don't know why more companies don't do it though, as you can also easily remove it too in a second. The toy bar is foamy with soft terry-cloth jungle-themed toys dangling from it. I was afraid it might be hard putting the boys down under it, but it hasn't been a problem. Plus, as I said, if they do hit the bar on the way down, the whole thing is soft like packaging noodles. You can also place the bar in the middle, bottom or way up at the top like I did. Since using this new changing pad with built-in toys, the boys went from complaining to enjoying lying there. They are now busy reaching up for the toys, even before I lie them completly down. It's funny to watch their little hands stretch out for it. It also has a safety strap, which we've now had to start using, since days of leaving them alone on there are over. The Summer Infant changing pad fits most standard changers and comes with a soft plush cover as well. It fit my Pottery Barn Kids dresser/changer top with no problems, in fact, it fit in it better than the other one had. My old changing pad cover, which matches the nursery decor fits on this pad too, which is great for when the other cover is in the wash.
Bottom line: I wish I had registered for this changing in the first place and that I had it months ago to entertain/distract the boys when they first started playing. The old pad is now at Grandma's house. Disclaimer: I reached out to Summer Infant for a sample to review for this post. I did not receive any further compensation. All opinions are my own. 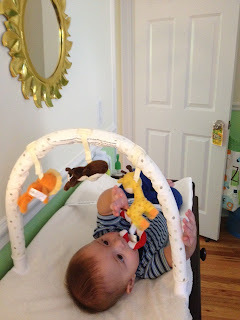 Each and very kid loves to play, no matter whether they are just born or big… having a toy bar is very important so that the kid will not try to move anywhere because he has what he want.